Actions that require both Kaffara and Qada. Fast-breaking actions that require Fasting as Qada only. 1. Actions that require both Kaffara and Qada. It is a sin to break our fast or not fast without an excuse during the month of Ramadan. When we are fasting, if we break the fast knowingly, we must seek forgiveness of Allah due to this sin. 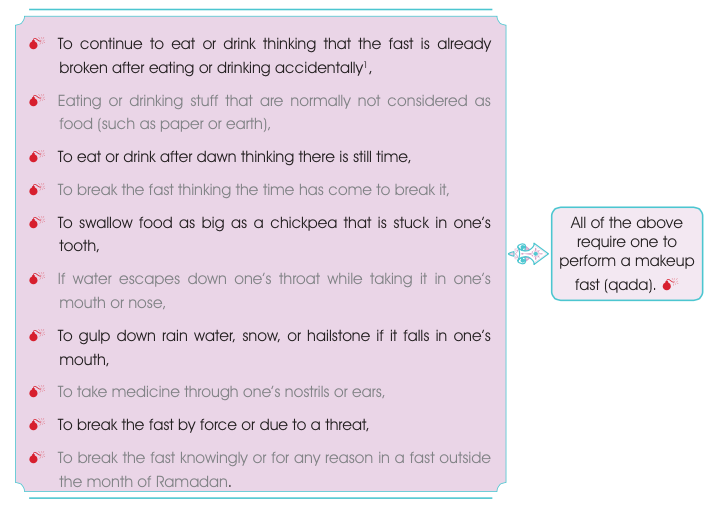 As a penalty, we must fast for two months (kaffara) and one additional day to make up the broken fast. 2. Fast-breaking actions that require Fasting as Qada only. Our fast can also be broken accidentally or due to an excuse. In this case, we only fast for those days that we have missed. 1. Eating or drinking does not break the fast if is done through forgetfulness. However, one should immediately stop ea- ting or drinking upon remembering. In this case, the fast is not nullified. That person washes his mouth and continues to fast. Fast breaks if anything goes down one’s throat after remembering that one was fasting. If he does not stop eating or drinking upon remembrance, the fast is nullified and he has to make qada instead. 1. 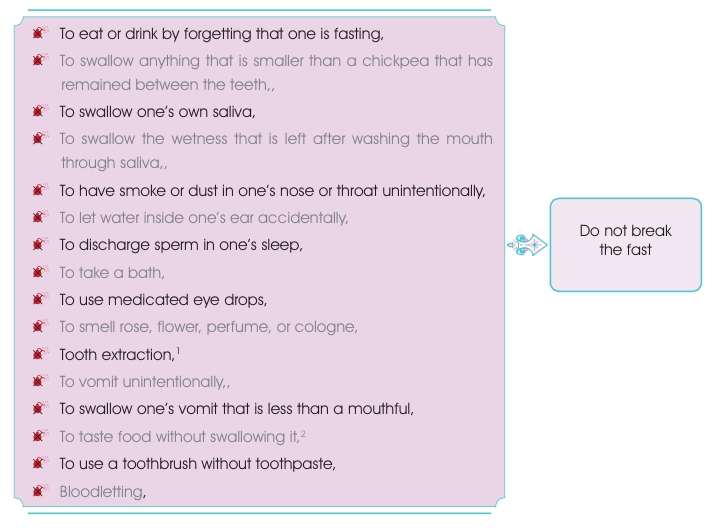 In tooth extraction, the spray-on morphine does not break the fast, but the injection of morphine does break the fast. 2. To taste a food without swallowing it is an objectionable act (makruh). UNDER WHAT CONDITIONS IS ONE NOT OBLIGED TO FAST?